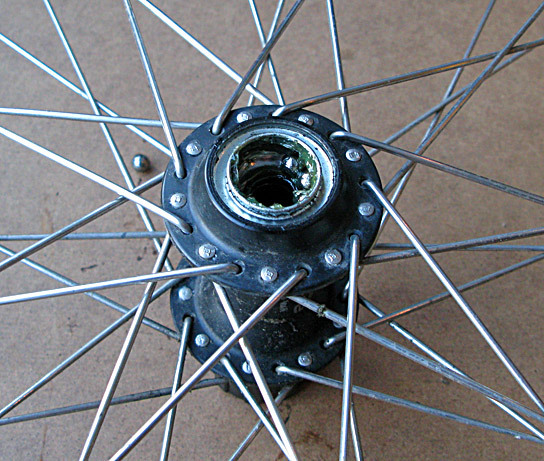 For the record: Shimano FH-M530 rear freehub. I'd been meaning to do this job for a while so this uncyclable weekend I bought a cone spanner and some ball bearings. I already had a chain whip, the special nut for removing a cassette, and some lithium grease. For me this is a first: stripping and reassembling a Shimano rear hub. 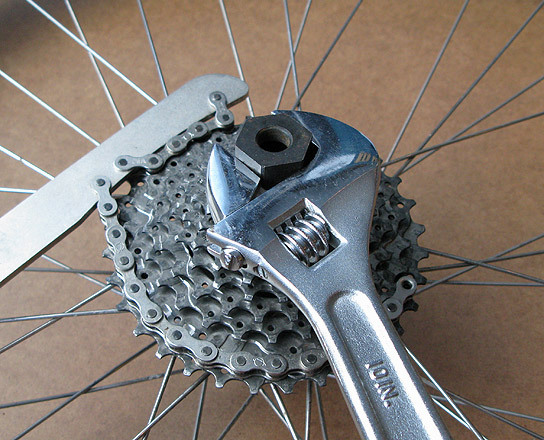 Tools and other items required: Chain whip, special nut for removing cassette lock ring, adjustable spanner, 15mm cone spanner (13mm for front hub), 18 x 1/4" ball bearings (20 x 3/16" for front hub), grease, small screwdriver or pen top to flip the old ball bearings out, rag. With the wheel off the bike I removed the outer rubber seal and the axle locknut on the non-drive side. 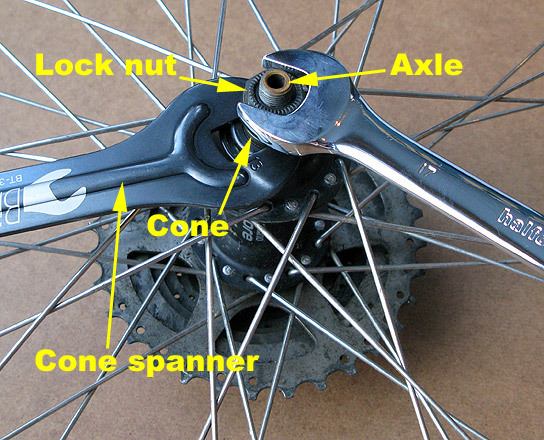 To do this you need the cone spanner to hold the cone, as the lock nut and cone are tightened up against each other (it's the same on both sides of the wheel). Rubber seal, lock nut, and spacers removed. Cone still in place on axle. Remove cassette lock ring with chain whip and special nut. After removing the cassette I unscrewed the non drive side cone and pulled out the axle from the drive side. This reveals the ball bearings, which are then flipped out. 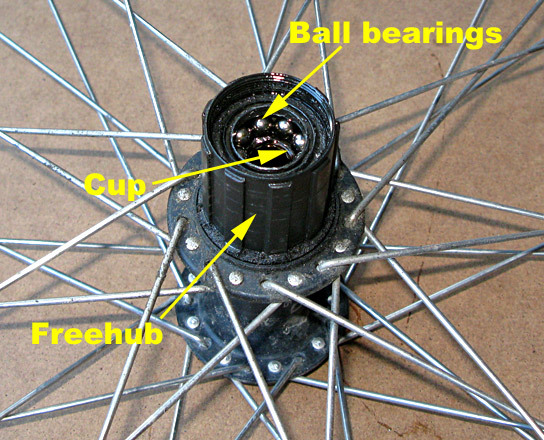 On the drive side the balls are inside the freehub and on the non drive side they're inside the hub itself. The 'cups' against which the balls are pressed by the cones are then cleaned out and checked for wear – grooves or pitting. Ball bearings on the drive side, inside the freehub body. Naturally, I cleaned the grime off the outside of the freehub before refitting the cassette at the end of the job. The hub flanges needed cleaning too. Ball bearings on the non drive side, inside the hub. I built this wheel just over a year ago, using the original Shimano Deore hub that came with my tourer, but this is the first time the hub has been serviced. There's still plenty of grease inside and no sign of wear on the cups, but I fitted new ball bearings anyway, nine on each side. As I gathered the old ball bearings off the floor I could find only seventeen – one had gone missing somewhere. Posted by Patrick on December 5th, 2010. 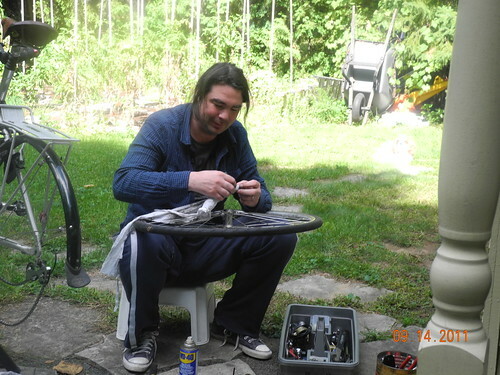 Years ago I used to enjoy stripping down my hubs but that was under the strict supervision of my mechanically minded ex. Somehow I've not had the nerve to do it on my own, I always have a great fear of making a perfectly running bike unrideable! I leave the pleasure to Brian, the excellent mechanic at Roberts, when my bike goes for her annual service. Maybe one day I'll pluck up the courage to follow your very informative instructions and try it on my other bike. I know what you mean about messing up a working bike. This job on the hub is actually very easy but I didn't know that before I did it. The thing is to remember where each of the rings, washers, seals etc goes, and which way round. It's very messy too. I had filthy grease everywhere and had to keep washing my hands to take the photos. A workshop would help. I just put a piece of hardboard on the carpet. The most difficult job I've come across on a bike is adjusting the front mech, even with a repair stand. I've never managed to set the one on my tourer so the chain doesn't rub one or the other side of the cage. Great step-by-step instructions, great photos, and an impressively clean workspace. I have never had the nerve to get down to the bearings, but based on your post I just might give it a whirl this season. Thanks Kern. Worth a go, I think. It's helpful to have the technical diagram. For my rear hub: this one from Shimano (384Kb PDF). I'm still not sure about the white grease. The original one was green. I suppose that's the nature of preventive maintenance, servicing the hub before it there are any signs of wear. Something I'm not particularly good at, I'm afraid. Patrick wrote: ...so I had ten balls where there should be nine! How did that happen? ... Tightening the non drive side cone a little, not a lot. There's your answer: it's magic! Yes, a magic ball, definitely. When I took the old balls out I gathered them up and put them on the sideboard. Two rolled off and fell on the carpet, but I could only find one. Then I cleaned the cups and put in the new balls – nine in each side (from 18 in the packet). The missing (old) ball must then have jumped back in! So when I'd tightened the cone and put the wheel back on the bike I could see the rim was out of true – because of the ten balls, not nine. This same ball fell back out when I took the cone off again. 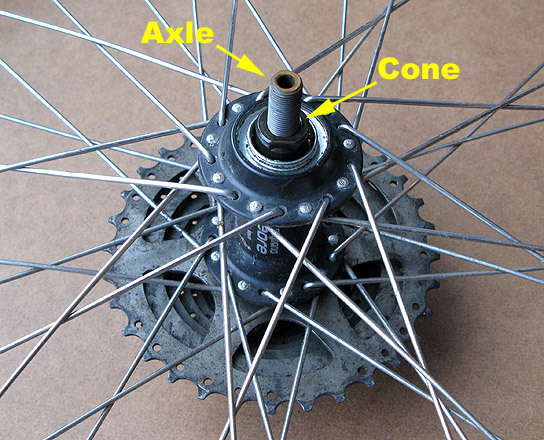 On this Shimano hub system overtightening the cone locks the wheel and prevents it from spinning, because you are essentially squashing the hub between both sets of balls. Great report Patrick. I always wondered what the chain whip was used for! I've often done it. I hate it. Getting the tightness right so that when the skewer's tightened there's no play, but it's not "gritty" to rotate is truly finicky. If it's loose it'll wear. If it's too tight you'll get galling and pitting. Galling is right. My daughter and son-in-law just finished a visit. I mentioned to Andrew that my derailleur needed some adjustment. Before I knew it he had the bike on the stand and had stripped down my rear hub to the bearings. It turns out he raced during his teenage years. Every weekend he and his mates would re-grease their hubs with only the most minute amount of grease. For his pains I set him up on the CompuTrainer and introduced him to Titanium Man! I bet he made it look easy too – re-greasing the hubs I mean. Did you make notes? I took my rear wheel to the shop as my cassette had about 1/8 in end float. seemed excessive. took the cassette off and the free wheel hub could be pulled in and out about a 1/8 in. i left it with them and come back to me saying hub bearing had seized causing the end float. the free wheel was working as it should and I just finished a ride never heard any bearing noise I only found end float when I was washing down bike. i was convinced the freehub securing bolt had started unscrewing. i have not got specific tools but or would have investigated it myself. is the seized bearing a plausible cause.